In which Rachel and Miles realize they scheduled the first video review for a week with no X-books, but blaze on nonetheless! If you want to see a more detailed breakdown of why page 19 of Cyclops #3 is so awesome, Rachel wrote one up over here. Liked the reviews, but I could barely hear them. Is it just me having problems, or do the audio levels need some work? It is probably not just you! The audio worked okay for us, but, as we mentioned in the video, this is *literally the first time we have ever done this,* and the odds of rookie mistakes are high. The audio was low for me too. Wonderful first episode though! Yeah, I had to turn the volume up pretty high to hear things clearly. Also, WTF, your voices are coming out of actual people. This is going to take getting used to. I would suggest a better microphone or even a cheap, wired lavalier mic from Amazon for like $20 or less. Something in the Audio Technica AT series would be alright and maybe a simple Y-splitter so that you can each have your own lav mic to use at the same time. It was a HUGE change in audio quality from your podcast (but that’s to be somewhat expected) and at the very least, you just need to boost your volume while recording. As for the content, how cool to get to see your expressions and enthusiasm. 🙂 I especially liked how you shared the page of Cyclops that Rachel bought. Your podcast is THE number one podcast I’ve been recommending to EVERYONE. 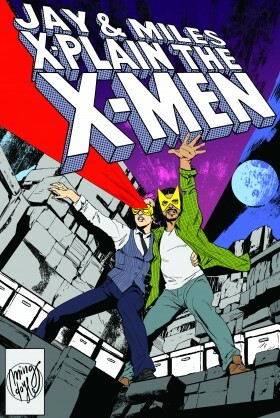 You voice just about every opinion I’ve ever had on the X-Men perfectly and with such style! The ONLY complaint I’ve EVER been able to come up with is the language. Soooo… that’s one point in favor of YouTube not allowing cussing for your show. Very funny ending to call that out, though, lol. Thanks for the audio advice, Deb! We’re currently looking into decent microphones for our videos, and your suggestions are really helpful – we definitely want to get that sounding better, although I doubt it’ll ever be as good as what we get with the recording equipment in Bobby’s studio. Glad you’re enjoying the show!